What is an optimization problem? Here's a typical optimization problem. Suppose that a shipping company delivers packages to its customers using a fleet of trucks. Every day, the company must assign packages to trucks, and then choose a route for each truck to deliver its packages. Each possible assignment of packages and routes has a cost, based on the total travel distance for the trucks, and possibly other factors as well. The problem is to choose the assignments of packages and routes that has the least cost. The objective—the quantity you want to optimize. In the example above, the objective is to minimize cost. To set up an optimization problem, you need to define a function that calculates the value of the objective for any possible solution. This is called the objective function. In the preceding example, the objective function would calculate the total cost of any assignment of packages and routes. The constraints—restrictions on the set of possible solutions, based on the specific requirements of the problem. For example, if the shipping company can't assign packages above a given weight to trucks, this would impose a constraint on the solutions. A feasible solution is one that satisfies all the given constraints for the problem, without necessarily being optimal. The first step in solving an optimization problem is identifying the objective and constraints. This section shows how to run a C# program that solves a very simple optimization problem: find the maximum value of the objective function x + y, subject to the constraints 0 ≤ x ≤ 1 and 0 ≤ y ≤ 2. The program is shown below. At this point, you don't need to understand the program in detail—we're just seeing how to run the code. // Create the variables x and y. // Create the objective function, x + y. // Call the solver and display the results. Copy and paste the code above into new file and save it as SimpleLpProgram.cs, in the subdirectory examples/dotnet of the directory where you installed OR-Tools. Note: You must run C# programs from the top level of the directory where you installed OR-Tools. to have the correct path to the packages directory. The easiest solution is to put your C# programs in the examples/dotnet/ directory. If you make changes to the program, you'll need to re-compile it as shown above. Next, we give an example of an optimization problem, and show how to set up and solve it in C#. 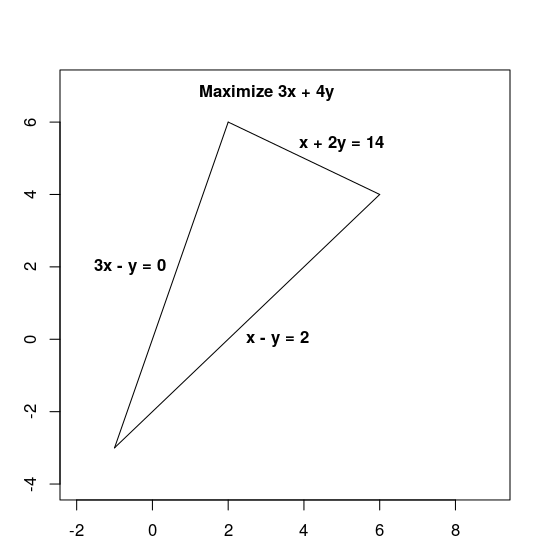 One of the oldest and most widely-used areas of optimization is linear optimization (or linear programming), in which the objective function and the constraints can be written as linear expressions. Here's a simple example of this type of problem. The objective function in this example is f(x, y) = 3x + 4y. Both the objective function and the constraints are given by linear expressions, which makes this a linear problem. The constraints define the feasible region, which is the triangle shown below, including its interior. Declare the solver—the method that implements an algorithm for finding the optimal solution. Invoke the solver and display the results. // x + 2y <= 14. // 3x - y >= 0. // x - y <= 2. // Objective function: 3x + 4y. Declare the solver. pywraplp is a Python wrapper for the underlying C++ solver. The argument GLOP_LINEAR_PROGRAMMING tells the solver to use Glop. // The value of each variable in the solution. // The objective value of the solution. // x and y are continuous non-negative variables. You can run the program as shown in Running a C# program above. The program returns the optimal solution to the problem, as shown below. The dashed green line is defined by setting the objective function equal to its optimal value of 34. 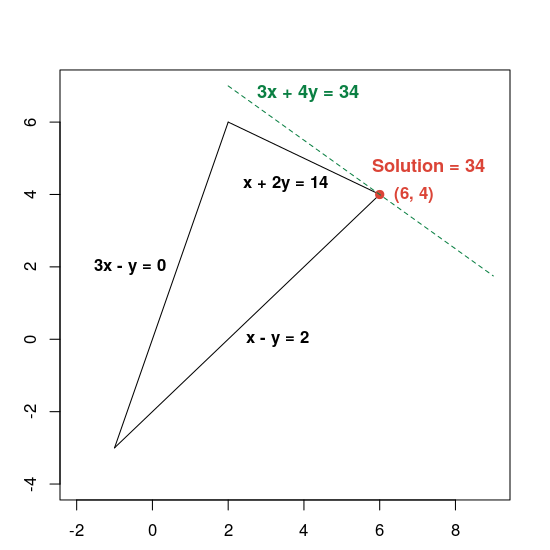 Any line whose equation has the form 3x + 4y = c is parallel to the dashed line, and 34 is the largest value of c for which the line intersects the feasible region. If you think about the geometry in the above graph, in any linear optimization problem at least one vertex of the feasible region must be an optimal solution. As a result, you can find an optimal solution by traversing the vertices of the feasible region until there is no more improvement in the objective function. This is the idea behind simplex algorithm, the most widely-used method for solving linear optimization problems. To learn more about solving linear optimization problems, see The Glop linear solver. OR-Tools includes a number of C# example programs that illustrate how to solve various types of optimization problems. The examples are in the examples/dotnet subdirectory of the directory where you installed OR-Tools. There are many different types of optimization problems in the world. For each type of problem, there are different approaches and algorithms for finding an optimal solution. Before you can start writing a program to solve an optimization problem, you need to identify what type of problem you are dealing with, and then choose an appropriate solver — an algorithm for finding an optimal solution. Below you will find a brief overview of the types of problems that OR-Tools solves, and links to the sections in this guide that explain how to solve each problem type. As you learned in the previous section, a linear optimization problem is one in which the objective function and the constraints linear expressions in the variables. The primary solver in OR-Tools for this type of problem is the linear optimization solver, which is actually a wrapper for several different libraries for linear and mixed-integer optimization, including third-party libraries. Constraint optimization, or constraint programming (CP), identifies feasible solutions out of a very large set of candidates, where the problem can be modeled in terms of arbitrary constraints. CP is based on feasibility (finding a feasible solution) rather than optimization (finding an optimal solution) and focuses on the constraints and variables rather than the objective function. However, CP can be used to solve optimization problems, simply by comparing the values of the objective function for all feasible solutions. A mixed integer optimization problem is one in which some or all of the variables are required to be integers. An example is the assignment problem, in which a group of workers needs be assigned to a set of tasks. For each worker and task, you define a variable whose value is 1 if the given worker is assigned to the given task, and 0 otherwise. In this case, the variables can only take on the values 0 or 1. Bin packing is the problem of packing a set of objects of different sizes into containers with different capacities. The goal is to pack as many of the objects as possible, subject to the capacities of the containers. A special case of this is the knapsack problem, in which there is just one container. Many optimization problems can be represented by a directed graph consisting of nodes and directed arcs between them. For example, transportation problems, in which goods are shipped across a railway network, can be represented by a graph in which the arcs are rail lines and the nodes are distribution centers. In the maximum flow problem, each arc has a maximum capacity that can be transported across it. The problem is to assign the amount of goods to be shipped across each arc so that the total quantity being transported is as large as possible. Assignment problems involve assigning a group of agents (say, workers or machines) to a set of tasks, where there is a fixed cost for assigning each agent to a specific task. The problem is to find the assignment with the least total cost. Assignment problems are actually a special case of network flow problems. Scheduling problems involve assigning resources to perform a set of tasks at specific times. An important example is the job shop problem, in which multiple jobs are processed on several machines. Each job consists of a sequence of tasks, which must be performed in a given order, and each task must be processed on a specific machine. The problem is to assign a schedule so that all jobs are completed in as short an interval of time as possible. Routing problems involve finding the optimal routes for a fleet of vehicles to traverse a network, defined by a directed graph. The problem of assigning packages to delivery trucks, described in What is an optimization problem?, is one example of a routing problem. Another is the traveling salesman problem.